Although garlic has been traditionally used for over 5,000 years, most scientific significance has just been developed in the past 50 years. The key compounds in garlic and its preparations include the following phytochemicals. Recently, researchers have been focusing on the benefits of a variety of sulfur-containing compounds in garlic instead of allicin. These are classified as oil- and water-soluble compounds. Oil-soluble compounds include sulfides, such as diallyl sulfide (DAS), diallyl disulfide (DADS), diallyl trisulfide and allyl methyl trisulfide, dithiins, and ajoene. Water-soluble compounds include cysteine derivatives, such as S-allyl cysteine (SAC), S-allyl mercaptocysteine (SAMC) and S-methyl cysteine, and gamma-glutamyl cysteine derivatives. Oil-soluble sulfur compounds are odorous, whereas water-soluble compounds are odorless. Moreover, water-soluble compounds are more stable and safer than oil-soluble compounds (1). Garlic was also found to contain unique non-sulfur compounds, such as allixin and saponins and recent studies have revealed the important contribution of these compounds to garlic's health benefits (2-4). Garlic Oils: These products offer minute amounts of garlic essential oil in a large amount of vegetable oil. They often express their "potencies" in theoretical amounts of raw garlic used to obtain the distilled garlic oil. There is no scientific data to show that the oil fraction represents all of the benefits of garlic. Garlic essential oil, which mainly contains several sulfides, is also the most potent source of garlic odor and causes body odor. In addition, garlic oils do not contain any of the important water-soluble compounds. Garlic Powders: Chemically, there is almost no difference between the garlic flavoring powders sold at grocery stores and the garlic supplements made of garlic powder and then sold at health food stores. Often these manufacturers claim that their products deliver allicin into the body. Though no garlic supplement can contain allicin due to its instability and high reactivity, some garlic powder products contain alliin and the enzyme, alliinase, and, therefore, can produce allicin with the addition of water in a test tube (the so-called "allicin potential"). However, allicin potential is an empty promise. The environments in a test tube and in our body are totally different and there is no scientific evidence to support the idea that allicin can be produced in the stomach. Furthermore, garlic powder contains only a residual amount of the alliin found in raw garlic, i.e., more than half of the alliin is lost during the manufacturing process. Garlic Oil Macerates: There are two types of oil macerate products on the market and both are packaged in soft gel capsules. One is made by simply mixing a garlic flavoring powder with vegetable oil. It's constituents are almost the same as the capsule and tablet forms of garlic powder. Another one is made by grounding raw garlic in vegetable oils. Since this type of product contains oil-soluble compounds (allicin break down products) and leftover alliin, it has a strong garlic odor. Both products are rich in fat -the major component being vegetable oil. Thus, they are not suitable for use as daily supplements. Garlic has been one of the most popular condiments. Garlic has also acquired a world-wide reputation in folklore including ancient civilizations, such as Egypt, Greece, Rome, Northern Europe, and China. Condiment/flavoring preparations: With little effort, you can find numerous recipes calling for garlic as a condiment/flavoring. Most of these recipes require some method of processing and/or cooking. Boiling and baking, and also very simple processes, such as slicing, chopping, or grinding raw garlic, initiate many chemical reactions within the garlic and result in completely different chemical constituents compared to those originally found in the whole raw garlic cloves. Salubrious/Salutary preparations Preparation of garlic for beneficial use can be classified into the following two categories: 1. 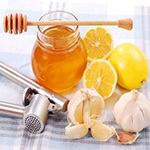 Topical/external use: Ground or sliced raw garlic cloves applied directly onto wounds or injuries. Used in this way, allicin, produced enzymatically from alliin, may play an important role in killing bacteria to prevent infections. However, allicin may also destroy tissues on contact, as previously mentioned, thus limiting the utility of its anti-bacterial properties and making it inappropriate for internal consumption. 2. Internal use: A number of recipes for the preparation of garlic for internal use are shown in the historical herbal books published in Europe, China and India. All of these recipes include some type of processing, such as boiling, baking, pickling or aging of raw garlic. In the Orient, aging is the unique and traditional method used to increase the benefits of herbs and to decrease or eliminate any toxicity. Hundreds of sulfur-containing compounds and unique amino acid derivatives formed through chemical and biological reactions, in addition to the non-sulfur compounds, contribute to the benefits of the internal use of garlic. Recent scientific findings have given validity to these traditional methods for preparing garlic. It is well-known that garlic cloves contain alliin and the enzyme, alliinase. Cutting or crushing garlic cloves activates alliinase, which catalyzes the reaction that converts alliin to allicin. However, allicin is an odorous, highly unstable and reactive/oxidative compound which readily decomposes to other sulfur-containing compounds (5, 6). Therefore, raw garlic and related preparations are chemically unstable and have been known to cause side effects, such as stomach disorders and allergic reactions when taken internally (7, 8). Thus, such preparations would be of limited application. Furthermore, since lack of bioavailability of allicin has been shown, garlic preparations containing allicin can be useful only for external application. On the other hand, processed garlic is rich in a variety of sulfur-containing compounds which may act synergistically or antagonistically to provide the benefits of garlic. Since these preparations contain little or none of the harsh and irritating compounds in raw garlic, they would cause less undesirable effects when consumed internally. sulfur-containing compounds, such as alliin and allicin, are converted to many other sulfur-containing compounds, which are mainly water-soluble. Aged Garlic Extract has been studied extensively and shown to have almost all known garlic benefits. Natural Aging-Bioconversion Pathway: This pathway leads both water- and oil-soluble sulfur compounds, mainly water-soluble. During the natural aging, the harsh and irritating compounds in raw garlic are converted mild, stable, safe and beneficial compounds. Cell Rupture-Allicin Decomposition Pathway: When garlic is cut or crushed, alliin is enzymatically converted into allicin. Allicin is highly unstable and rapidly decomposes under uncontrollable chemical reactions to produce odorous oil-soluble sulfur compounds. 1. Imada O. Toxicity Aspect of Garlic. In abstract of the First World Congress on the Health Significance of Garlic and Garlic Constituents, p. 47, 1990. 2. Matsuura H., Ushiroguchi T., Itakura Y. et al. L. Chem. Pharm. Bull., 36: 3659-3663, 1988. 3. Nishino H., Nishino A., Takayasu J. et al. Cancer J., 3: 20-21, 1990. 4. Yamasaki T., Teel R.W. and Lau B.H.S. Cancer Let. 59: 89-94, 1991. 5. Block E. Chem. Int. Ed. Engl. 31: 1135-1178, 1992. 6. Yu T-H. and Wu C-M. J. Food Sci., 54: 977-981, 1989. 7. Nakagawa S., Masamoto K., Sumiyoshi H. et al. J. Toxicol Sci. 5: 91-112, 1980. 8. Lybarger J.A., Gallagher J.S., Pulver D.W. et al. J. Allergy Clin. Immunol. 69: 448-454, 1982.